Pioneers in the industry, we offer lutron - force gauge, 100 kg- model no-fg-5100, lutron - lcr meter - model no- lcr-9183, lutron - 4 in 1 anemometer, humidity meter light meter, thermometer meter - model no - lm-8100, lutron - o2 meter model no- po2-250, lutron - infrared thermometer 1000c- model no-tm-969 and lutron - uv light meter, rs-232 - model no-uva-365a from India. 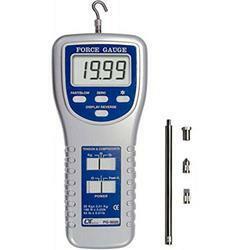 Lutron - FORCE GAUGE, 100 Kg- Model No-FG-5100FEATURES* Large LCD display with back light. * Tension & compression capability . * 100 Kg, wide capacity, high resolution, high accuracy, high repeatability. * 3 kind display unit, Kg/LB/Newton. * Seperate sensor. * Peak hold ( Max. load ) can be held in display during make tension or compression measurement. * Zero button can operate both for normal measuring & the " peak hold " operation. * Full capacity zero (tare) control capability. * Fast/Slow response time push button. * Positive or reverse display direction select. * Over load protection. * Hand held & stand mounting available. * Low power consumption gives long battery life. * Build in low battery indicator. * Microprocessor circuit & exclusive load cell transducer. * RS-232 computer interface . * Power supply built-in DC 9V adapter input socket. SPECIFICATIONS:* Display = LCD ( Liquid crystal display ). 5 digits, 16 mm ( 0.63" ) digit size. Back light. * Display Direction = Positive or Reverse direction, select by the push button on the front panel. * Function = Tension & Compression (Push & Pull). Normal force, Peak hold ( Max. load ). * Peak hold = Will freeze the display value of the Peak load ( Max. load ). * Zero = Zero button can be operated both for "normal force" or "peak hold" operation * Unit select = Kg/LB/Newton * Measure Capacity = 100 Kg/220 LB/980 Newton. * Resolution = 0.05 Kg/0.05 LB/0.2 Newton. * Min. Display 0.15 Kg/0.35 LB/1.4 Newton. * Accuracy = ± (0.5 % + 2 digits), within 23± 5 .C / Under the test weight on 100 Kg & 10 Kg. * Data output RS-232 serial computer interface. 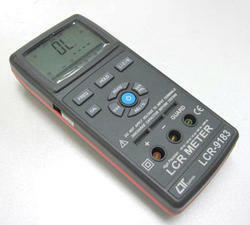 LUTRON - LCR METER - Model No- LCR-9183FEATURES: * 19,999/1,999 counts dual LCD display. * AutoLCR smart check and measurement. * Serial/Parallel modes are selectable. * Ls/Lp/Cs/Cp with D/Q/! /ESR parameters. * Support DCR mode 1.00 " to 200.0 M" . * Five different test frequency are available = 100 Hz/120 Hz/1 KHz/10 KHz/100 KHz. * Test AC signal level : 0.6 V rms typically. * Test range : ( ex. F = 1 KHz ) L : 200.00 uH to 2000.0 H C : 2000.0 pF to 2.000 mF R : 20.000" to 200.0 M" * Multi-level battery detector. * RS232/USB PC Computer interface. * Can default auto power off. 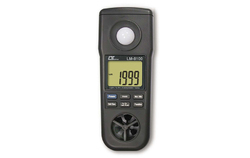 * 4 in 1 professional measuring instrument: Anemometer, Hygrometer, Thermometer, and Light meter. * Tiny bone shape with lightweight and small size case design are suitable for handling with one hand. * Wristlet design provides extra protection to the instrument especially for user one hand operation. * Low-friction ball bearing mounted wheel design provides high accuracy at high and low air velocity. * Exclusive photo diode and color correction filter light sensor, spectrum meets C.I.E. photopic. * High precision humidity sensor with fast response time. * Standard type K (NiCr-NiAl) thermocouple input jack suitable for all kinds of type K probe.
. * Computer data output interface ( RS232/USB ). GENERAL SPECIFICATIONS :* Display = LCD display, LCD soze : 41.5 x 31.5 mm. * Measurement = Anemometer, Humidity, Temperature. Light * Operating = Max. 80% RH. * Humidity Temperatur = 0 to 50° C (32 to 122° F) * Temperature Over Input Indication of "- "* Power Supply = DC 1.5 V battery ( UM4, AAA ) x 6 PCs, * DC 9V adapter input. @ AC/DC power adapter is optional. * Power Anemoter = Approx. DC 11 mA. *Consumption Other functions - Approx. DC 7.5 mA. * Weight = 280 g/0.62 LB ( battery included ). *Dimension = HWD 177 x 70 x 32 mm ( 7.0x 2.8 x 1.3 inch). OPTIONAL TEMPERATURE PROBE AND OTHER ACCESSORIES:* RS232 Cable UPCB-02 = Isolated RS232 cable. Used to connect the meter to the computer ( COM port )* USB cable, USB-01 = USB cable. Used to connect the meter to the computer ( USB port ). 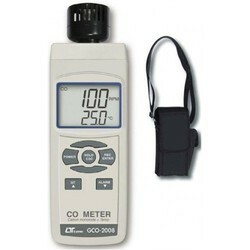 Your purchase of this OXYGEN METER marks a step forward for you into the field of precision measurement. 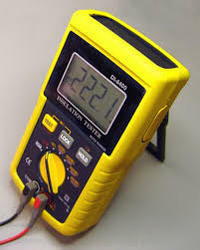 Although this METER is a complex and delicate instrument, its durable structure will allow many years of use if proper operatingtechniques are developed. Please read the following instructions carefully and always keep this manual within easy reach. 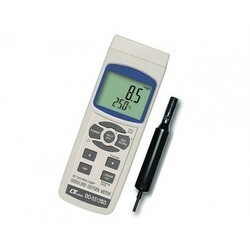 Display = LCD size : 28 mm x 19 mmMeasurement O2 ( Air oxygen ) Temperature ( Air Temp. )Circuit = Custom one-chip of microprocessor LSI circuit.Data Hold = Freeze the display reading.Sampling Time = Approx. 1 second.Power off = Auto shut off saves battery life. * None contact infrared temperature measurement up to 1,000 measurement.C* Type K thermocouple thermometer, up to 1400 measurement.C* Dual laser for better targeting. * Large LCD display with back light. * D/S ratio value : 50/1. * Min., Max., Differential, Average, Lock mode. * Last measurement memory. * Hi/Lo Temperature Audio Alarm. * Laser target and Back light On/Off control. * Adjustable emissivity value from 0.1 to 1.00. * Preset emissivity value at 0.95. * Power supply by two AAA batteries, long life. FEATURES* Long wave 365 nm ultra-violet irradiance measurement. * Professional, high quality UVA meter. * Wide measurement range, 199.9 uW/cm^2, 1.999 mW/cm^2 and 19.99 mW/cm^2. * Microprocessor circuit assures maximum possible accuracy, provided special functions and features. * Exclusive UVA sensor with correction filter. * Super large LCD display, easy readout. * Heavy duty & compact housing case. * Records Maximum, Minimum with recall. * Data hold. * Auto power off saves battery life. * Operates from 9V battery. * RS232 PC serial interface. * Zero adjustment by push button. GENERAL SPECIFICATIONS:* Circuit = Custom one-chip microprocessor LSI circuit. * Display = 13 mm ( 0.5" ) large LCD display. Dual function display. * Linearity = ± 1%. * Sensor = The exclusive photo diode & UVA color correction filter. * Memory Recall = Records Maximum & Minimum reading with recall. * Zero Adj.Sample Time = By push button. * Approx. 0.4 sec. * Short wave 254 nm ultra-violet irradiance measurement. * Professional, high quality UVC meter. * Wide measurement range, 199.9 uW/cm^2, 1.999 mW/cm^2 and 19.99 mW/cm^2. * Microprocessor circuit assures maximum possible accuracy, provided special functions and features. * Exclusive UVA sensor with correction filter. * Super large LCD display, easy readout. * Heavy duty & compact housing case. * Records Maximum, Minimum with recall. * Data hold. * Auto power off saves battery life. * Operates from 9V battery. * RS232 PC serial interface. * Zero adjustment by push button. FEATURES: ULTRASONIC LEAKAGE DETECTOR is designed to locate the source of the ultrasonic emissions generated by gas, air leaks.... The leakage level is displayed by "Bar LED Display Panel" and converted to audible sound by either internal buzzer or external optional earphone. SPECIFICATIONS Sensitivity for Leakage Indicator = Bar LED display panel & audible tone. * The LED display indicator of the detector is a relative measurement only. * Frequency Response = 20 KHz to 100 KHz. * Power Supply = DC 9V battery. 006P, MN1604 ( PP3 ) or equivalent, Alkaline or heavy duty type battery. * Power Consumption = Approx. DC 34 mA. * Operating Temp. 0 C to 50 C( 32 Fto 122 F ). * Operating Humidity = Less than 80% RH. * Weight = Approx. 260 g/0.57 LB ( including battery ). * Size HWD 255 x 70 x 28 mm ( 10.0 x 2.8 x 1.1 inch ). SPECIFICATIONS:* Frequency Output = 40 KHz. *Oscillator Circuit 640 KHz crystal time base & divided by 16. *Operating Temperature 0 to 50 ( 32 to 122 ). CCFF*Operating Humidity Less than 80% RH. *Power Supply DC 9V battery. 006P, MN1604 ( PP3 ) or equivalent, Alkaline or heavy duty type battery. *Power Consumption Approx. DC 7.5 mA. *Weight 122 g/0.27 LB ( included battery ). *Size 146 x 50 x 26 mm ( 5.7 x 2.0 x 1.0 inch ). LUTRON - HIGH TEMP IR THERMOMETER plus type K-J-R-E-T = Model No-TM-939* -20 to 650 Wide range IR temperature measurement. 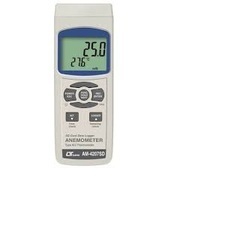 * Infrared thermometer, non-contact temperature measurement, -20 to 650 ( -4 to 1202 ), CCFF precision for none contact temperature measurement. * Emissivity adjustment for IR thermometer. *Laser guide for IR thermometer. * 2 in 1, Infrared thermometer + Thermocouple ( Type K/J/T/E/R ) thermometer. * Thermocouple probe accepts 5 different types : type K, type J, type T, type E, type R. * Microcomputer circuit with high performance. * Build in & select button on the front panel.CF * Data hold function for stored the desired value on display. * Memory function to record the maximum & minimum readin g with recall. * Build the REL button, useful for relative measurement. * Sensor select button on the front panel, easy to change different type probe. * RS 232 data output, easy cooperate with computer. * Optional data acquisition software for data record. * Auto power shut off saves battery life. * Built-in low battery indicator. * Heavy duty & compact housing case with stand. * 006P DC 9V battery poer supply. * Memory Recall = Memorize the Maximum, Minimum reading with recall. * Offset Adjustment = For thermocouple thermometer offset adjustment by pushing button on front panel. GENERAL SPECIFICATIONS:Display = 51 mm x 32 mm supper large LCD display, 15 mm ( 0.6" ) digit size. Measurement:1. 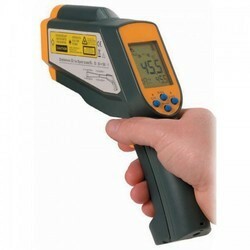 Infrared thermometer ( Non contact temperature measurement )2. Thermocouple probe, type K/J/T/E/R 3. IR Sensor Thermocouple pie. 4. IR Measure Wave Length WRegion = 6 to 12 micro meter. SD Card real time data recorder,HOT WIRE ANEMOMETER, + type K/J Temp. * Model AM-4214SD* Real time data recorder, save the data into the SD memory card and can be down load to the Excel, extra software is no need. * 0.2 - 25.0 m/s, high precision for low air velocity measurement. * m/s, ft/min, km/h, knots, mile/h,oC/oF. * Type K Thermometer -100 to 1300 oC, oC/oF. 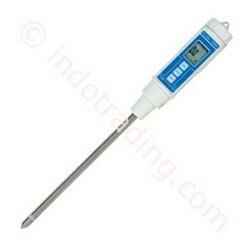 * Type J Thermometer -100 to 1200 oC, oC/oF. * Data hold, Record (Max., Min.). * RS232/USB computer interface. * Patented. * Patent Taiwan, China, Japan, Germany, USA pending. FEATURES* Range : 20 A/200 A/1200 A. * Output sensitivity : 10 mV/A, 1 mV/A, 0.1 mV/A. * Output voltage : 200 ACmV ( 20 A, 200 A ), 120 ACmV ( 1200 A ) * Max. conductor size : 50 mm ( 1.9 inch ) Dia. * Operation frequency : 50 Hz/60 Hz. 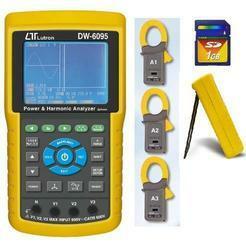 * Optional current probe for DW-6093, DW-6095. * When change the new probe, the calibration procedures are not necessary to be executed. * Signal output use the banana plugs, durable and safety. 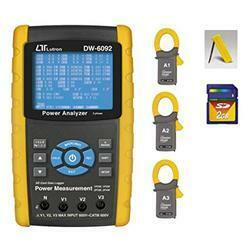 * Power supply is from the meter (DW-6093, DW-6095 ), battery is not necessary. * Operating Humidity = Less than 80% RH. FEATURES:* Digital display, easy and correct read-out. * Auto-range and multi-function for insulation measurement of 4/40/400/4000 M ( 100 V, 250 V, 500 V, 1000 V ). * Insulation measurement with auto discharge function, safety. * Build in the ACV & DCV & OHMS measurement function. * Precision 400 ohm & 4000 ohm auto-range easy for measuring low resistance such as motor windings, relay coils etc. * A continuity beeper is equipped in OHM range. * Data hold function to lock the current reading. * Lock & Test functions offer worker's safety and easy operation. * 77 X 49 mm (1.06" height) large LCD display. * Battery operating easily to carry with user. * LCD display allows clear read-out even at bright place. * LSI-circuit provides high reliability and durability. * Built-in over-input and low battery indication. * Overload protection for each range. * Automatic zero adjust & automatic circuit discharge. * Durable & portable housing case with the front protective cover. * RS-232 computer interface. * Powered by AA DC 1.5V X 8 batteries. * Dimension 225 x 125 x 64 mm (8.86 x 4.92 x 2.52 inch), Weight 819 g / 1.80 LB (includes 8 PCs batteries). * Range DCA, ACA, 200 A, 2000 A. * DCA Output 1 DCmV/1 DCA. * ACA Output 1 ACmV/1 ACA. Lutron - FORCE GAUGE 20 Kg - Model No-FG-6020SDFEATURES:* Data record mode : Normal model or Peak hold mode. * Normal record mode - Set sampling time from 1 second to 8 hours. * Peak hold record mode : Set sampling time from 10 ms to 500 ms. * Memory capacity of normal record mode : 1 GB to 16 GB. * Memory capacity of peak hold record mode - 1000 data no. ( max. ) * Under Peak hold record mode, if execute the " Data record " function, the memory circuit will store 1000 data no. ( max. ) measuring data into the SD card per fast speed sampling time ( 10 ms to 500 ms ). * Under Normal record mode, if execute the " Data record " function, will save the measuring data along the real time value ( Year/Month/ Date/Hour/Minute/Second ) into the SD card per normal sampling time ( 1 second to 8 hours ). * After save the data into the SD memory card, it can be down load the data to the Excel directly, extra software is no need. User can make the further data analysis (graphic analysis ) by themselves. * Large LCD display with back light. * 20 Kg, wide capacity, high resolution, high accuracy, high repeatability. * 3 kind display unit : Kg, lb, Newton. * Tension & compression capability . * Peak hold ( Max. load ) can be held in display during make tension or compression measurement. * Zero button can operate both for normal measuring & the " peak hold " operation. * Full capacity zero (tare) control capability. * Fast/Slow response time push button. * Positive or reverse display direction select. * Full line accessories ( adapters ) are included. 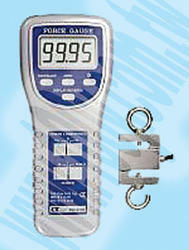 * Hand held & stand mounted gauges are available. * Low power consumption gives long battery life. * Build in low battery indicator. * Microprocessor circuit & exclusive load cell transducer. * Over load protection. * RS-232 computer interface * Built-in DC 9V power adapter input socket. * Professional test stand ( optional ). SPECIFICATIONS:* Display = LCD ( Liquid crystal display ). / 5 digits, 16 mm ( 0.63" ) digit size. Back light. * Display Direction= Positive or Reverse direction, select by the push button on the front panel. * Function Tension & Compression (Push & Pull). Normal force, Peak hold ( Max. load ). * Peak hold = Will freeze the display value of the Peak load ( Max. load ). * Zero = Zero button can be operated both for "normal force" or "peak hold" operation * Unit select = Kg, lb, Newton. * Measure Capacity = 20.00 Kg/44.10 lb/196.12 Newton. * Resolution = 0.01 Kg/0.01 lb/0.02 Newton. * Min. Display 0.02 Kg/0.07 lb/0.3 Newton. 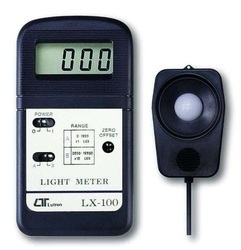 LUTRON - LIGHT METER - Model No-LX-100, LX - 100F FEATURES:* Economical cost * High accuracy in measuring. * Sensor used the exclusive photo diode & color * LSI circuit provides high reliability and correction filter, spectrum meet C.I.E. durability. 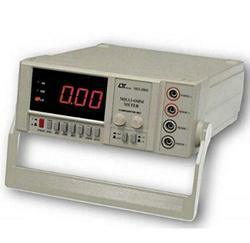 * LCD display allows clear readout-out even at* Sensor cosine correction factor meet standard. high ambient light level. * Separate LIGHT SENSOR allows user to * Pocket size , easy to carry out & operation. * Compact, light weight and excellent operation. * Built-in low battery indicator.GENERAL SPECIFICATIONS:Display = 13 mm ( 0.5" ) LCD, 3 1/2 digits. Maximum indication 1999. Sensor = The exclusive photo diode & color correction filter, spectrum meet Operating Humidity = Max. 80% RH.Power Consumption = Approx. DC 2.7 mA. 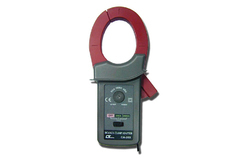 FEATURES* Wide range, general purpose magnetic measurement. for industrial, mechanical, material, electrical, laboratory field usage. * Unit : G ( Gauss ), mT ( milli Tesla ). 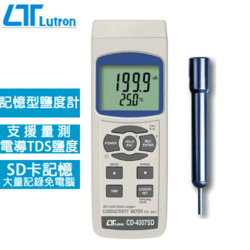 * DC and AC magnetic field measurement * DC Range : 300.00 mT/3000.0 mT. AC Range : 150.00 mT/1500.0 mT. * Resolution : 0.01/0.1 mT, 0.1/1 G. * N pole/S pole indicator. * Use Hall sensor with automatic Temp. compensation. * Zero button for DC magnetic function. * Separate probe, easy operation and convenient for remote measurement. * Data hold function for freezing the desired value on display. * Records Maximum and Minimum readings with Recall. * RS232/USB computer interface. * Microprocessor circuit assures maximum possible accuracy, provides special functions and features. * Heavy duty & compact housing with hard carrying case, designed for easy carry out & operation. * Auto shut off is available to save battery life. * Power supply from batteries or DC 9V adapter in. SPECIFICATIONS:* Circuit = Custom one-chip of microprocessor LSI circuit. * Display = LCD size = 52 mm x 38 mm dual function LCD display. *Field Direction = Uniaxial. * Data Hold = Freeze the display reading. * Memory Recall = Maximum & Minimum value. FEATURES:* This meter is specially designed for measuring or monitoring electromagnetic field value for the micro-wave frequency precisely. * Useful equipment to detect the leakage of micro wave oven. * Build in alarm setting, when the measuring value > 1 mW/cm^2 , the buzzer will sound to remind that the measured device's micro wave EMF value ( leakage value ) is larger than the safety level. * The meter have been calibrated precisely on the frequency value 2.45 GHz. * Peak hold function to latch the max. measuring value. *Powered by 006P 9V battery and DC 9V adapter. 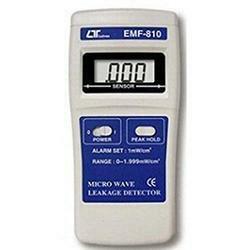 *Except to measure the micro wave's EMF value, the detector also can measure the radio EMF value of hospital equipment, radar, radiation work, TV antenna, Radio station , welding equipment , baking- equipment, television , computer , factory, laboratory , and other environment...etc for reference. SPECIFICATIONS:* Display = LCD size : 40 mm x 25 mm. / Digit size : 12 mm x 6 mm. * Measurement Unit = mW/cm^2* Operating Frequency Range = 2.45 GHz ± 50 MHz* Peak Hold = To latch the max. measuring value. * Alarm Setting = If reading value > 1 mW/cm^2 approximately, the buzzer will sound. FEATURES:* 4 terminal devices for accurate measurement of very low resistance. Ideal for measuring the resistance of components precisely. * Ideal for testing protective conductors, lightning conductors and welded points. * Wide measuring range, 0.01 m ohm - 20K ohm, 7 ranges. 20 mm, large size LED display, easy read-out. * LSI circuit provides high accuracy, reliability and durability. * Built-in over input protection. * Durable bench type housing plastic case stand. * Built-in over input protection. General Specifications:Warning Setup:* Warning LED Indicator* Buzzer*Operating Temp. 0 to 50 ( 32 to 122 ). CF*Operating Humidity = Less than 80 % R.H..* Power Supply = AC 110V ± 15%, 50/60 Hz / or AC 230V ± 15%, 50/60 Hz.Fuse for Power:* 200 mA/250 V Supply / * Size : 5 X 20 mm dia..Dimension = 280 x 210 x 90 mm ( 11.0 x 8.3 x 3.5 inch)Weight =Approx. 2.2 Kg ( 4.85 LB ). FEATURES:* Designed to check the moisture level of wood, concrete, and other non-wood material. * 6 % to 40 % moisture range on wood. * 0 to 100% relative moisture value for Concrete and other non-wood material. * All in one, meter build in the test pins. * Data hold function to freeze the desired value on display. * Microprocessor circuit ensures high accuracy and provides special functions and features. * Operates from DC 1.5V ( UM4/AAA ) x 4 PCs batteries. * Built-in low battery indicator. * With the pins' protection cover. * Durable, long-lasting components, enclosed in strong, compact ABS-plastic housing. SPECIFICATIONS:* Applications Designed to check the moisture level of wood, concrete and other non-wood material. * MeasuringPrincipal = Used the 2 pins electrode to measure the conductive ability of the species, then converter to the reading of % " Moisture of Content ". *Display = LCD size : 28 mm x 19 mm. *Circuit Probe= Custom one-chip of microprocessor LSI circuit. Your purchase of this DISSOLVED OXYGEN METER with SD CARD DATA LOGGER marks a step forward for you into the field of precision measurement. Although this meter a complex and delicate instrument, its durable structure will allowmany years of use if proper operating techniques are developed. Please read the following instructions carefully and always keep this manual within easy reach. 1. FEATURES* Precision Dissolved Oxygen measurement* Dissolved oxygen : 0 to 20.0 mg/L. 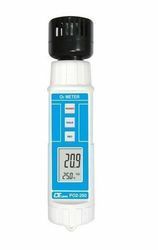 * Dissolved oxygen meter use the polar graphic type oxygen probe with temperature sensor, high precision measurement for Dissolved Oxygen ( DO ) and temperature measurement. * Heavy duty dissolved oxygen probe, probe head can connect with BOD bottle. * DO use the automatic Temp. compensation. * DO meter build in " % SALT " & " Mountain Height " compensation value adjustment. * Separate probe, easy for operation of different measurement environment. * Real time SD memory card Datalogger, it Built-in Clock and Calendar, real time data recorder , sampling time set from 1 sec to 8 hour 59 min. 59 sec. * Manual datalogger is available ( set the sampling time to 0 ), during execute the manual datalogger function, it can set the different position ( location ) No. ( position 1 to position 99 ). * Innovation and easy operation, computer is not need to setup extra software, after execute datalogger, just take away the SD card from the meter and plug in the SD card into the computer, it can down load the all the measured value with the time information ( year/month/date/hour/minute/second ) to the Excel directly, then user can make the further data or graphic analysis by themselves. * SD card capacity : 1 GB to 16 GB. * LCD with green light backlight, easy reading. * Can default auto power off or manual power off. * Data hold, record max. and min. reading. * Microcomputer circuit, high accuracy. * Power by UM3/AA ( 1.5 V ) x 6 batteries or DC 9V adapter. * RS232/USB PC COMPUTER interface. 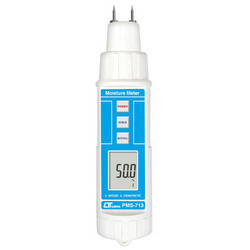 * pH measurement range : 0 to 14 pH x 0.01 pH. * pH function with high input impedance avoids measuring error. * Microprocessor circuit assures high accuracy and reliable performance. * Large LCD, dual function display. * Records Maximum and Minimum readings with recall. * Data hold. * Auto power shut off to battery life or manual power off. * Powered by 006P DC 9V battery. 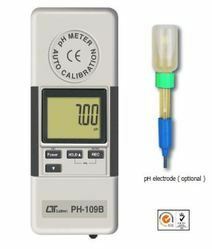 * Easy and automatic pH calibration procedures. * Using the durable, long-lasting components and a strong lightweight ABS-plastic housing case. * Wide applications: water conditioning, aquariums, beverage, fish hatcheries, food processing, photography, laboratory, paper industry, plating industry, quality control, school & college. * pH Calibration = pH 7, pH 4, and pH 10, 3 points calibration ensure the best linearity and accuracy. * Data hold = Hold the current reading value on the display. * Memory Recall = Maximum and Minimum reading values can be saved and retrieved by record function. * Sampling Time = Approx. 1 second. * Power off = Auto shut off saves battery life or manual off by push button. GENERAL SPECIFICATIONS:*Circuit = Custom one-chip of microprocessor LSI circuit. * Display = 40 mm x 32 mm LCD ( Liquid crystal display ). FEATURES* Meter can cooperate with 2, 5, 10, 20, 50, 100, 200, 400 Bar sensor, new calibration procedures are not necessary when change the new sensor . * When change the new pressure sensor, just select pressure type ( 2, 5, 10, 20, 50, 100, 200, 400 bar ) on the front panel button. The sensor type will memorize into the circuit permanently. * 8 kind pressure units ( Bar, Psi, Kg/cm^2, mm Hg, inch Hg, meter H20, inch H20, Atmosphere ), unit select by push button on the front panel. * Full line optional pressure sensors are available. * Cooperate the external pressure sensor that its output signal is 100 mV for full scale. * Zero button on the front panel, easy adjust the zero value of pressure sensor. * Available push button gain adjustment, usage for calibration precisely if necessary. * Separate pressure sensor, easy for remote measurement. * Microprocessor circuit assures maximum possible accuracy, provides special functions and features, * Real time SD memory card Datalogger, built-in Clock and Calendar, sampling time can set from 1 sec to 8 hour 59 min. 59 sec. * Manual datalogger is available, during execute the manual datalogger function, it can set the different location no. ( position 1 to position 99 ). * SD card capacity : 1 GB to 16 GB. * LCD with green light backlight, easy reading. * It can default auto power off or manual power off. * Data hold, record max. and min. reading. * Microcomputer circuit, high accuracy. * Power by UM3/AA ( 1.5 V ) x 6 batteries or DC 9V adapter. * RS232/USB PC computer interface. GENERAL SPECIFICATIONS:* Circuit 7 = Custom one-chip of microprocessor LSI circuit. * Display LCD size - 52 mm x 38 mm / LCD with green backlight ( ON/OFF ). * Operating Humidity = Less than 80% R.H. FEATURES:* One meter for multi purpose operation - Conductivity, TDS ( Total dissolved solids ), Salt measurement. * Conductivity : 200 uS/2 mS/20 mS/200 mS. * Salt : 0 to 12 % salt ( % weight ). * Conductivity measurement can select Temp. Coefficient of measurement solution. * ATC for the conductivity measurement. * Separate probe, easy for operation of different measurement environment. * Real time SD memory card Datalogger, built-in Clock and Calendar, sampling time can set from 1 sec to 8 hour 59 min. 59 sec. 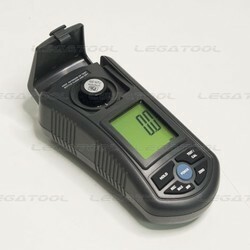 * Manual datalogger is available, during execute the manual datalogger function, it can set the different location no. ( position 1 to position 99 ). * Innovation and easy operation, computer is not need to setup extra software, after execute datalogger, just take away the SD card from the meter and plug in the SD card into the computer, it can down load the all the measured value with the time information ( year/month/date/ hour/minute/second ) to the Excel directly, thenuser can make the further data or graphic analysis by themselves. * SD card capacity : 1 GB to 16 GB. * LCD with green light backlight, easy reading. * It can default auto power off or manual power off. * Data hold, record max. and min. reading. * Microcomputer circuit, high accuracy. * Power by UM3/AA ( 1.5 V ) x 6 batteries or DC 9V adapter. * RS232/USB PC COMPUTER interface. FEATURES:* The Digital Stroboscope is used the microprocessor circuit design, high accuracy, digital readout, light duty, that is ideal for inspecting and measuring the speed of moving gears, fans, centrifuges, pumps, motors and other equipment used in general industrial maintenance, production, quality control, laboratories and as well as for schools and colleges for demonstrating strobe action. * Digital synthesis circuit, high stability and high adjusting resolution, easy operation. * Crystal time base to offer high accuracy measurement & fast measuring time. * Xenon flash tube, high intensity. * Wide range : 60 to 32,000 RPM. * Adjustment resolution : 0.1 RPM ( < 1,000 RPM ), 1 RPM ( 1,000 RPM ).>* High intensity light. * Setting buttons : Digital adjust button, x 2 button, ÷ 2 button, + button, - button, easy operating. * Xenon flash tube with plug and socket, easy to make the tube replacement. * Compact and heavy duty housing case. FLASH TUBE SPECIFICATION:Flash tube = Xenon lamp.Flash Duration = Approximately 60 to 1,000 microseconds.Flash color Temp. = Xenon white 6,500 K degree.Flash energy = 4 Watts-seconds (joules).Beam Angle = 80 degrees. FEATURES * World's patent, Multi-functions, one instrument combine Photo Tach. ( RPM ) & Contact Tach. ( RPM, m/min., ft/min. ). * Laser light source, long detecting distance. * Wide measuring range from 0.5 to 100,000 RPM. * 0.1 RPM resolution for the measured value < 1000 RPM. * High precison with 0.05% accuracy. * The last value, max., value, min. value will be stored into the memory automatically & can be obtained by pressing Memory Call Button. * High visible LCD display gives RPM reading exactly with no guessing or errors & saves battery energy. 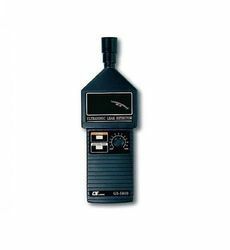 * This tachometer used the exclusive one chip MICRO-COMPUTER LSI circuit & crystal time base, offer the high accuratemeasurement & fast sampling time. * The use of durable, long lasting components, including a strong, light weight ABS plastic housing, assures almost maintenance free performance for many years. * The housing cabinet has been carefully shaped to fit comfortable in either hand. * Memory = Last/Max./Min. value. * Battery = 4 x 1.5V AA ( UM-3 ) batteries. SPECIFICATIONS:Display = 5 digits, 10 mm ( 0.4" ) LCD. Accuracy = ± ( 0.05% + 1 digit ), RPM only. Light Source = 1 mW class 2 laser diode. Time base = Quartz crystal. FEATURES:* Designed to meet ISO 7027. * NTU ( Nephelometric TURBIDITY Unit ) measuring unit. * Wide and auto measurement range : 0 to 1,000 NTU. * High resolution : 0.01 NTU/1 NTU. * The unique optics structure, enables the instrument to read low value of TURBIDITY to the high level up to 1,000 NTU. * Four operation buttons and two calibration points, easy operation. * Jumbo LCD, easy readout. * Microprocessor circuit assures maximum possible accuracy, provides special functions and features. * Battery operated for field and on-site testing convenience. * Data hold function for freezing the desired value on display. * Records Maximum and Minimum readings with Recall. * Heavy duty & compact housing with hard carrying case, designed for easy carry out & operation. * Auto shut off is available to save battery life. * Application : Test municipal water, food and beverage water, or other aqueous solution where fluid clarity is important. SPECIFICATIONS:Circuit = Custom one-chip of microprocessor LSI circuit.Display = LCD size : 41 mm x 34 mmResolution = 0.01 NTU/ 1 NTUAccuracy = ± 5 % F.S. or ± 0.5 NTU, which ever is greater.Light source = LED, 850 nm.Detector = Photo diodeStandard = Meet ISO 7027.Response time =Less than 10 seconds.Sample volume needed = 10 mL.Data Hold = Freeze the display reading.Memory Recall = Maximum & Minimum value.Display Sampling Time = Approx. 1 second.Calibration points = 0 NTU, 100 NTU.Operating Temperature = 0 to 50 COperating Humidity = Less than 85% R.H.
* Absolute vacuum & absolute pressure measurement. * Wide measure range from 1 to 1500 mbar. * Overload protection up to 2000 mbar max. * Separate probe, easy operation. * Application - Automobile, Industrial, laboratory, heating, ventilation, medical hospital. * Heavy duty sensor used for air, oil gas, liquid. * 7 kind display units ( torr, mm Hg, mbar, KPa, hPa, inch Hg, psi ) select by push button on the front panel. * Real time SD memory card Datalogger, built-in Clock and Calendar, sampling time can set from 1 sec to 8 hour 59 min. 59 sec. 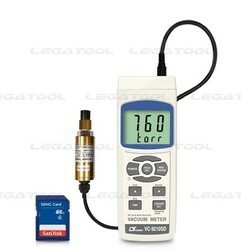 * Manual datalogger is available, during execute the manual datalogger function, it can set the different location no. ( position 1 to position 99 ). * Innovation and easy operation, computer is not need to setup extra software, after execute datalogger, just take away the SD card from the meter and plug in the SD card into the computer, it can down load the all the measured value with the time information ( year/month/date/ hour/minute/second ) to the Excel directly, the user can make the further data or graphic analysis by themselves. * LCD with green light backlight, easy reading. * It can default auto power off or manual power off. * Data hold, record max. and min. reading. * Power by UM3/AA ( 1.5 V ) x 6 batteries or DC 9V adapter. * RS232/USB PC computer interface. * Circuit Custom one-chip of microprocessor LSI circuit. * Display LCD size - 52 mm x 38 mm / LCD with green backlight ( ON/OFF ). * Display units 7 kind display units : torr, mm Hg, mbar, KPa, hPa, inch Hg, psi. * Zero adjust Push button on the front panel. * Span adjust Push button gain adjustment, usage for calibration precisely if necessary. * Data error no. 0.1% of total saved data max. * Memory Card SD memory card. 1 GB to 16 GB. * Data Hold Freeze the display reading. * Memory Recall Maximum & Minimum value. * Analysis for 3 phase multi-power system, 1P/2W, 1P/3W, 3P/3W, 3P/4W * Voltage & Current are the True RMS value. * True Power ( KW MW GW ) measurement. * Apparent Power ( KVA MVA GVA ) measurement. * Reactive Power ( KVAR MVAR GVAR) measurement. * Watt-Hour ( WH SH QH PFH ). * Power Factor( PF ) Phase Angle. * Voltage measurement range : 10 to 600 ACV * Current measurement range: 0.2A to 1200 ACA. * Programmable CT ratio (1 to 600) and PT ratio (1 to 1000). * ACV input impedance is 10 Mega ohms. * Safety Standard - IEC 1010, CAT III 600V* Built-in clock and Calendar, real time data record with SD memory card , sampling time set from 2 to 7200 seconds. Just slot in the SD card into the computer, it can down load the all the measured value with the time information ( year/month/data/ hour/mimute/second ) to the Excel directly, then user can make the further data analysis by themselves. * Complete set with 4 PCs Test Leads, 4 PCs Alligator clips, 3 PCs Clamp Probe, AC to DC 9V adapter,2 G SD memory card and Carrying bag. * Computer data output, can cooperate with USB Cable /USB-01 RS232 cable/UPCB-02 and Data Acquisition software, SW-U801-WIN. Circuit = Custom one-chip of microprocessor LSI circuit Wire connections = 1P/2W, 1P/3W, 3P/3W, 3P/4W. Voltage ranges = 10 ACV to 600 ACV, auto range. Current ranges = 0.2 ACA to 1200 ACA, auto range/manual range. Safety standard = IEC1010 CAT III 600 V.
Operating Temperature = 0 to 50 ( 0 to 122 ).CFOperating Humidity = Less than 80% R.H.
* Two function : CO ( Carbon monoxide ), Temperature. * CO range : 0 to 1,000 ppm x 1 ppm. * Temperature. 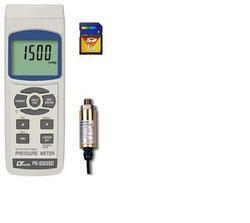 : 0 to 50 , / CC F* CO measurement with fast response time. * High repeatability and high accuracy. * stand-alone device, easy to carryout and operation. * CO function with alarm setting. * Large S-TN LCD, high contrast, easy readout. * Data hold function for freezing the desired value on display. * Records Maximum and Minimum readings with Recall. * RS232/USB computer interface. * Microprocessor circuit assures maximum possible accuracy, provides special functions and features. * Heavy duty & compact housing with hard carrying case, designed for easy carry out & operation. * Auto shut off is available to save battery life. * Power supply from batteries or DC 9V adapter in. GENERAL SPECIFICATIONS Circuit C= Custom one-chip of microprocessor LSI circuit.Display = LCD size : 52 mm x 38 mm dual function LCD display. Measurement CO( Carbon dioxide ),Temperature Unit= CO - Tempppm = C F Temperature compensation = Automatic temp for Compensation CO measurement. Advanced Setting = Auto power off enable/disable setting setting= CF setting / CO alarm value setting Alarm Setting For CO measurement only. 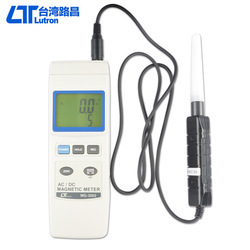 Sensor Type CO : Electrochemical Temperature : Thermister Data Hold= Freeze the display reading. Memory Recall = Maximum & Minimum value.Display Sampling Time = Approx. 1 second. Power off = Auto shut off saves battery life or manual off by push button. * Applications for industrial vibration monitoring - All industrial machinery vibrates. The level of vibration is a useful guide to machine condition. Poor balance, misalignment & looseness of the structure will cause the vibration level increase, it is a sure sign that the maintenance is needed. * Frequency range 10 Hz - 1 kHz, sensitivity relative meet ISO 2954. * Professional vibration meter supply with vibration sensor & magnetic base, full set. * Velocity measuring range 200 mm/s. * Acceleration measuring range 200 m/s^2. * Data hold button to freeze the desired reading. * Memory function to record maximum and minimum reading with recall. * Separate vibration probe, easy operation * RS 232 computer interface. * Optional data acquisition software for data record & datalogger. * Super large LCD display. * Microcomputer circuit, high performance. * Auto shut off saves battery life. * Built-in low battery indicator. * Heavy duty & compact housing case. * Complete set with the hard carrying case. * RMS & Peak measurement. SPECIFICATIONS:Display = 61 mm x 34 mm supper large LCD display / 15 mm ( 0.6" ) digit size. Circuit = Exclusive microcomputer circuit. Data hold = Freeze the desired reading. Peak hold = To measure the peak value. Memory = Maximum & Minimum value. Power off = Auto shut off, saves battery life, or manual off by push button.Sampling time = Approx. 1 second.Data output = RS 232 serial output, isolate.Operating humidity =Less than 80% RH. Description :HEAT INDEX WBGT METERModel : WBGT-2010SD* WBGT (wet-bulb globe temperature) was developed as a monitoring basis at US military training camps and became widespread for the use in workplaces and sports situation It is suggested in the international standard ISO 7243, OSHA (US Occupation Safety), Japan Society for Occupational Health and the SMA (Sports Medicine Australia) to establish the permissible heat exposure limits inhealth, sports or other physical activities. * Measurement : WBGT value (Indoor/Outdoor Wet bulb globe temperature), Black globe temperature, Humidity, Air temperature, Wet bulb temperature, Dew point Temp. * Measurement function:1. Wet bulb globe temperature (WBGT):* Indoor : 0 oC to 59 oC. * Outdoor : 0 oC to 56 oC.2. Black globe Temp (TG) : 0 to 80 oC.3. Air temperature (TA) : 0 to 50 oC.4. Wet bulb temperature (WB) : -21.6 oC to 50.0 oC.5. Humidity : 5 % to 95 % R.H..6. Dew point Temp. : -25.3 oC to 48.9 oC. * Unit : oC,oF, Resolution : 0.1 degree. * Adjustable WBGT alarm setting with buzzer sound output. * Control and monitor of physical activity in hot environment to limit the danger of heatrelated injuries. * Globe temperature measurement uses the Pt sensor, high accuracy. * Fast humidity measuring response time. * Direct measurement of the radiation effect with a brass black ball in 75 mm dia. * Real time SD memory card recorder, it is built-in Clock and Calendar. * Real time data recorder , sampling time set from 1 second to 3600 seconds. * Manual data record is available, can set the different position (location) No. (1 to 99). * Innovation and easy operation, computer is not need to setup extra software. After record the data, just take away the SD card from the meter and plug into the computer, the measured values with the time information(year/month/date/ hour/minute/second) can be downloaded to the Excel directly, then user can make the further data or graphic analysis by themselves. * SD card capacity : 1 GB to 16 GB. * Data hold, record max. and min. reading. * Power by UM3/AA (1.5 V) x 6 batteries or DC 9V adapter. * RS232/USB PC computer interface. * Complete set with the carrying case, SD card is optional. FEATURES* Designed to check the moisture level of soil or other similar material. * Measurement range : 0 % to 50 % moisture content of soil sample with 0.1 % resolution. * All in one digital soil meter, easy to make operation. * Data hold function to freeze the desired value on display. * Microprocessor circuit ensures high accuracy and provides special functions and features. * Operates from DC 1.5V ( UM4/AAA ) x 4 PCs batteries. * Built-in low battery indicator. * Durable, long-lasting components, enclosed in strong, compact ABS-plastic housing. SPECIFICATIONS:* Applications = Designed to check the moisture level of soil or other similar material. * Measuring Principal = Used the 2 pins electrode to measure the conductive ability of the species, then converter to the reading of " % " Moisture content " of soil sample. * Display = LCD size : 28 mm x 19 mm. * Measurement Range = 0 % to 50 % moisture content on soil. * Resolution = 0.1 %. * Data Hold = Freeze the display reading. * Sampling Time = Approx. 0.8 second. * Operating Temp.= 0 to 50. C* Operating Humidity = Less than 80% R.H.* Power Supply = DC 1.5 V battery ( UM4/AAA ) x 4 PCs,* Power Current = Approx. DC 12 mA* Weight = 267 g/ 0.58 LB. * This Digital Oxygen Meter is supplied with a polarographic type probe with an incorporated temp.' sensor which serves for precision Dissolved Oxygen (DO), Oxygen in air (O2), Temp. measurement Applications for Aquarium,Medical research, Agriculture, Fish hatcheries, Laboratory, Water conditioning, Mining industrial, Schools & Colleges, Quality control. * Automatic temp. compensation from 0 to 50 0C for sensor. * Build in "% SALT" & '1Mountain Height" compensation, adjust the factor by push the button on the front panel. * Auto shut off saves battery life. * Microprocessor circuit assures high accuracy and provides special functions and features. * Super large LCD display with contrast adjustment for best viewing angle. * Multi display, show oxygen & temp. at the same time. * Records Maximum, Minimum and Average readings with RECALL. * Data hold. * Operates from 006P DC 9V battery. * RS 232 PC serial interface. Specification:* Circuit = Custom one-chip of microprocessor LSI circuit. * Operating Temperature = 0 °C to 50 °C (32 °F to 122 °F)* Operating Humidity = Max 80% RH* Data Output = RS 232 PC serial interface* Power off = Auto shut off saves battery life, or manual off by push button* Sensor Structure = The polarographic type oxygen probe with an incorporated temp. sensor. * The quality of the water is getting much more concerned by the human being and it also an important factor in the industrial sectors, laboratories or other fields. * In industrial sectors, it would be a great help for the quality of the products if using the good water ( more pure water ) in the process. 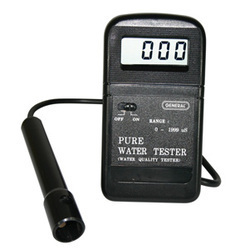 * It may cause several diseases if home drink water existing high conductivity & contain impurities, the Pure Water Tester ( Water Quality Tester) are designed to check the purity of water (water conductivity) also can determine the condition of the " Water Filter " easily and rapidly. * The tester is used to measure the conductivity value (ranging from 0 - 2000 uS) which can therefore judge whether water is pure or not. The conductivity value will become lower if there is much less impurities existed in water (for example, distilled water that its purity is higher than others will get a lower conductivity value of approx. < 10 uS). * Many people always take many kinds of procedures on water treatment by install the different kinds of equipment, such as filter or purifier to improve the quality of water. However, most of people do not know whether the procedures or filter is effective and can con- tribute to the quality of water. General speaking, the impurities will be filtered out if the water process procedures attain the expected result, thus we can use this instrument to measure the conductivity value of purified water and to judge the effect of the filter (or water process procedures). APPLICATION:* Water conditioning, aquariums, beverage, fish hatcheries, food processing, photography, laboratory, paper industry, plating industry, quality control, school & college. * Check the condition of the water filter.